Delivering babies is all in the day’s work for the busy Midwives at the local hospital but it’s unusual to have five of your own pregnant at the same time! 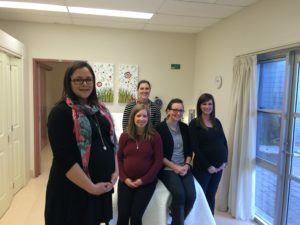 The pregnant midwives didn’t plan their pregnancies to coincide with their workmates and it is unusual but delightful at the same time, said Acting Maternity Unit Manager Midwifery, Chelsea Anderson. “This is a very exciting time for the Broken Hill Maternity Unit. We wish our colleagues all the best in this next step in their lives and look forward to meeting these five new babies,” said Ms Anderson. The pregnant midwives (from left) Jerri McInnes, Carly Knight, Emma Kemp (behind), Thea Ritchie and Shae McCunnie. The Maternity Unit has ensured the high quality of dedicated care provided pregnant women continues when the midwives go on maternity leave over the next six months. “There won’t be a pregnant pause in our service,” joked Ms Anderson. “A midwife will always be available for each woman and the same high quality and dedicated service will be provided to the community,” she said. “There may be some changes to the way women access the service and women may have their known midwife change when the Midwifery Group Practice (MGP) midwife goes on leave and a new midwife starts. “Women will still have phone access to a particular midwife 24/7 as well as phone and physical access to the maternity ward midwives 24/7. The midwives are all highly qualified and capable of the workload and safety of women and their child will always be first priority,” she said. Ms Anderson said the Maternity Unit is currently in the process of recruiting midwives to fill the vacant maternity relief positions when they occur. Anyone with any questions or concerns are encouraged to contact the Maternity Unit (08) 8080 1386.